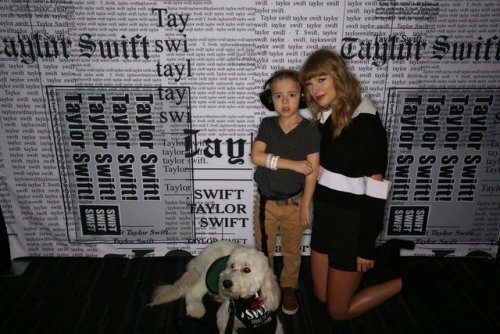 Autism Speaks: “Taylor Swift donated $10,000 towards my son’s service dog. She gave us front row seats and backstage passes to her concert this past weekend. Taylor Swift was so kind. She said Reid was a big puffball and so cute. She was especially awesome with Jacob. She didn’t see my son’s disability she just saw him. She got down on her knees and looked him right in the eyes and said hello and that she was thankful HE came to her show even though she knew it was loud and there was so much going on. 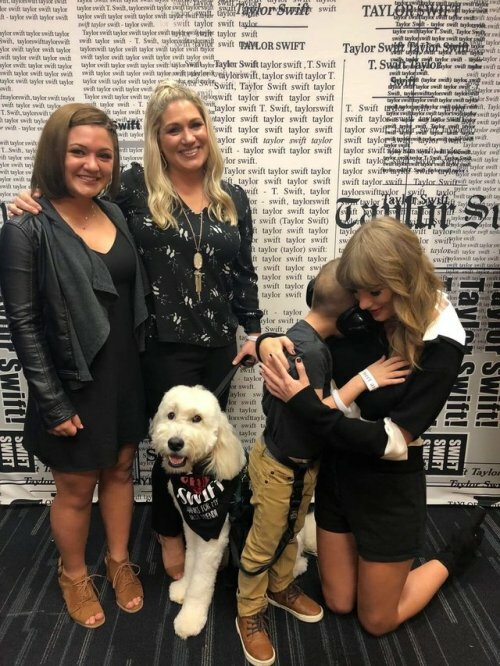 He grabbed her face and pulled her hair back and said ‘Hi Taylor!’ which was something we were working on all week, but didn’t know if he would be able to say it. She was very gracious and acted like him grabbing her face didn’t even phase her. After the picture was taken, the flash scared him so he snuggled right up to her and her sweet smile says it all. My daughter, Jordan, was pumped to meet her. We feel so blessed! Taylor is such an amazing person for doing this for us…again! Jacob made it through almost the entire concert. Taylor is such an autism advocate, we love her!” ~Allison H.